Lots of projects hosted in jboss.org JIRA uses original "Git Pull request workflow" created about four years ago. This workflow allow user to manually switch issue to "Pull Request Sent" status once GitHub PR is created, and manually insert URL of pull request into "Git Pull Request" issue field. This workflow allows projects to better track and process Pull Requests, but heavily depends on manual work. New JIRA features like DVCS plugin and event based workflow transitions introduces in JIRA 6.3 series allowed us now to create better PR tracking workflow, which removes this manual work. This workflow automatically switch issue to "Pull Request Sent" status once GitHub PR is created and issue key is mentioned in PR's name or description. Pull Request URL is not stored in "Git Pull Request" issue field, but it is visible in "Development" area of JIRA issue detail screen. 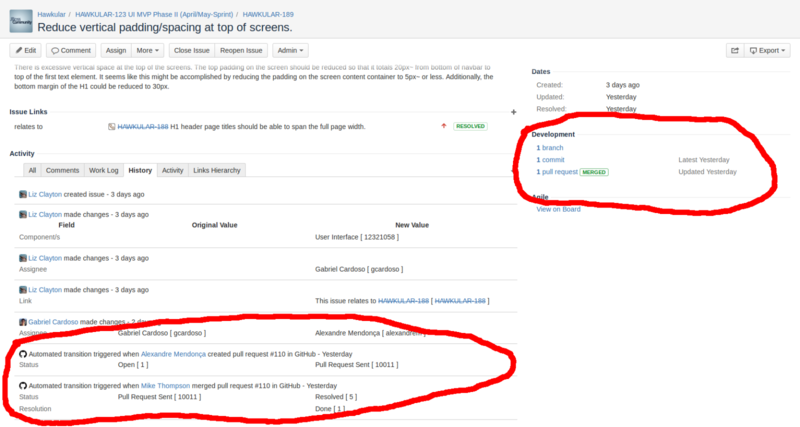 JIRA issue is automatically resolved once GitHub PR is merged then. If GitHub PR is refused then no any JIRA issue status change is done. jboss-jira-hook github user must be added into the organization's Owners group. Jira needs this to add webhooks into GitHub repository to track changes immediately. then you have to email help@jboss.org with request to add your GitHub repository into JIRA configuration and switch your JIRA project to use "GIT Pull Request workflow with automatic PR triggers workflow scheme". You have to specify which Github repositories do you want to add (all owned by some Organization, or few named only) and which JIRA project should be switched. Thanks pilhuhn for Feature request for this improved workflow and his testing on Hawkular project.